The course is led by FIFA instructor and Oceania Football Confederation (OFC) Women’s Development Officer, Nicola Demaine. On the ground Demaine is supported by SIFF Women’s Development Officer, Diane Justus. Thirty participants have registered for the course which follows up an earlier course conducted by Demaine in 2012. The objective is to reinforce participants’ knowledge and understanding from the previous while introducing several new concepts to improve and enhance the ability of coaches to work with women footballers. The course was declared open by FIFA Development Officer for Oceania, Glenn Turner, who challenged the participants to take women’s football in Solomon Islands to another level. 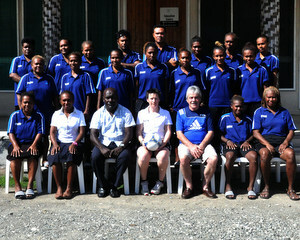 “I want to offer you participants the challenge to make things happen for women’s football in Solomon Islands. You must take all you can from this course and apply them with your players and your clubs,” Turner said. SIFF Chief Executive Officer, Neil Poloso, thanked participants for their commitment to football and encouraged them to use the opportunity well. “It is greatly pleasing for SIFF to see the number of women who are willing to attend this course and contribute to developing football. I hope that you will make good use of the important opportunity and make a difference in your communities with the training,” Poloso says. The FIFA women’s coaching course is funded by FIFA.